Aayush Sharma and Warina Hussain, who are about to make their debut in Bollywood with Loveratri, have started promoting their upcoming movie. After visiting the ‘city of joy’ Kolkata, the actors are now headed for Ranchi for promotion activity. The highlight of their visit is that the debutants will be meeting former Indian cricket team captain MS Dhoni for a private dinner. As soon as Dhoni came to know about their visit, he called to check their itinerary and invited Aayush and Warina over for dinner at his residence. 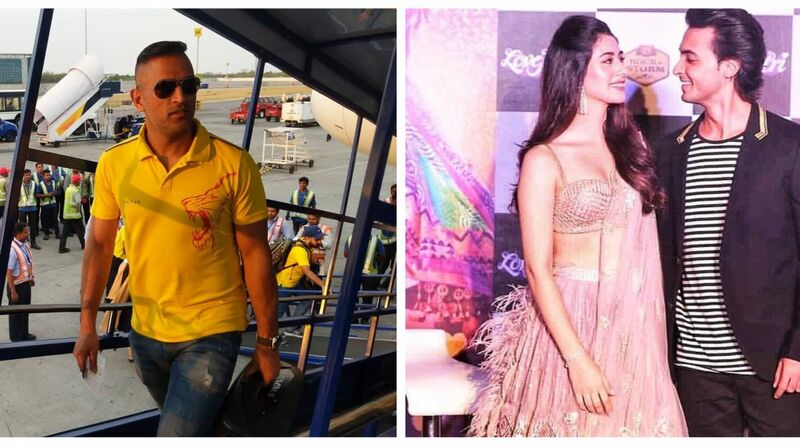 The actors will land in Ranchi on Friday and will meet MS Dhoni and family for dinner at night. The Loveratri stars have kickstarted the film’s promotion in full swing. The trailer had earlier set the mood right with foot-tapping music and colourful backdrop ahead of the festive season of Navratri. With Garba being an essential factor in the story, both Aayush and Warina took extensive lessons to learn the dance form. The lead pair has been piquing the interest of the audience with videos and pictures from their Garba training. Written by Niren Bhatt, Loveratri is directed by debutante Abhiraj Minawala. The romantic drama is produced under the banner of Salman Khan Films. The film is slated to release on 5 October 2018.